If you need a side dish to wow guests or to bring to a function, this is it. I mean who doesn't love carrots? Ok, mom I know you don't, but everyone else does. This is also the perfect dish to get your kids to eat their veggies. The carrots are slightly sweetened and the warm spiciness from the cinnamon is so comforting. 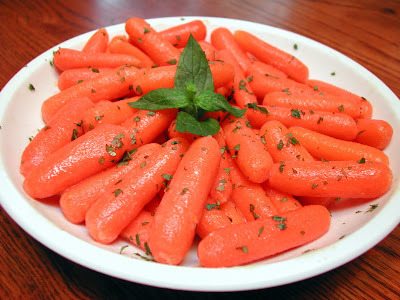 Steam baby carrots for about 8-10 minutes or until tender. Set aside. Place other ingredients in a large, heavy saucepan. Bring to a boil over medium-high heat, stirring occasionally, until the sauce becomes thickened, about 15 minutes. Add the carrots and mix to coat evenly. Transfer to a serving platter and top with fresh mint. Yum! I also make carrots with a horseradish sauce. We still have a week and a half left before the kiddos are back in school. You wouldn't believe how many packages of carrots are in my fridge right now. I need to bake a cake. Lisa, A horseradish sauce sounds so intriguing. I'll have to get that one from you! Em, Ohhh. Carrot cake sounds so good right now.